First, let’s talk about what we mean when we say “a reluctant reader.” They come in all shapes and sizes. Students who fake read, avoid reading, create distractions with their behavior when it’s time to read, students who take forever to get assignments done because they can’t seem to stay focused, students who read the same book over and over again and students who seem to find lots of other things to do instead of reading could all be classified as reluctant or hesitant readers, so before you can find the right strategy to motivate a reluctant reader, you need to understand the why they don’t read. 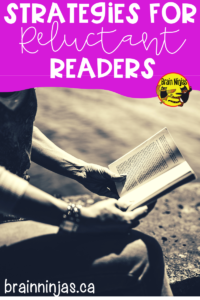 Ask yourself-why are they a reluctant reader? Why aren’t they reading? Have you watched your non-readers to see what they are doing when they are supposed to be reading? 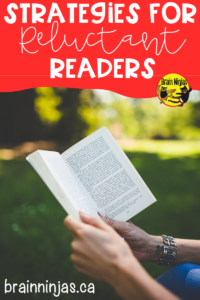 Truth is-some probably are reading, but maybe they aren’t doing the right type of reading (or the reading we think they should be doing during silent reading time). Other students are struggling readers and will do everything and anything to get out of reading. What type of reluctant readers do you have in your class? We’ve examined our class and found most students fall into these categories when they consistently avoid reading over a few weeks. Only Reads Graphic Novels: The relationship with graphic novels is a complicated one. Some teachers believe reading graphic novels is not really reading, whereas others understand the complexities of visually reading facial expressions, understanding dialogue and following the story over several pages quickly. How often have parents complained to you about students reading graphic novels? It’s a genre that didn’t even really exist twenty years ago. Whether you think graphic novels are great or not isn’t the point. No student should only be reading one genre all the time. It’s perfectly fine to have a favourite (love me some suspense) but as teachers we are trying to curate an understanding of different genres, styles and writing methods to develop readers as well as writers. One way we challenged our students to explore other genres was to make it a bit of a game. We created a genre style bingo-ish game where students are challenged to read different books over the course of three to four months. Genres include everything from graphic novels to blog posts, magazines to how-to manuals. If this is something you think your students would enjoy, you can find it here in English or ici en francais. Only Reads One Book: If your student is only reading one type of book (or maybe even the same book over and over again) relax. Rereading improves fluency and comprehension, so it’s not the end of the world if a student rereads. Haven’t you ever read your favourite book more than once? Or think of the preschooler who wants their favourite bedtime story every single night and can recite it word for word. So, maybe it’s a case of finding similar books. This means doing some reader advisory. Ask your student why they like the book and then try to find something else similar. It could be another series by the same author, another book that deals with the same subject matter or another series written in the same style. For example: We know lots of students love the Diary of a Wimpy Kid Series by Jeff Kinney. Many of these students don’t branch out from this series because they enjoy the style. Ask students to try Timmy Failure by Stephan Pastis, Tom Gates by Liz Pichon or Stink by Megan McDonald. Fake readers: These students fake read most often because they can’t read, but drawing attention to it will only make it worse. Help these students find book that interests them-even if it’s just to look at the pictures. Finding something fascinating to look at in a book will eventually turn into reading text, so be patient and spent your instructional time getting to the root of the problem. Some students fake read because they have other things on their mind. Even as adults, it’s easy to fake read (every single time you are at professional development and you are ask to read an article and then discuss it with your elbow partner-am I right?) when we are distracted, emotional or eager to leave a staff meeting. And fake it until you make it is a valid mantra. Your student can’t read well or thinks they can’t read well: Well, this is where being a teacher comes in handy. Never underestimate the power of explicit teaching. 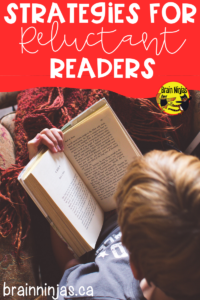 By the time students get to grades four or five they have defined themselves as either a reader or a non-reader, but both types of students need to be taught how to read. Up to this point students learn to read, but once they cross the line from primary into intermediate students are expected to read to learn. This means any student who did not make grade level by the end of grade three is at a disadvantage. Take a look at your reading instruction. Are you teaching comprehension and decoding strategies to the students who need it? Do you know which of your students are struggling? What is causing the struggle? Students who think they can’t read just need some confidence boosting, which comes in the form of practice in real-world and meaningful ways. Some of these are listed below. These students also require explicit teaching for comprehension. It’s the only way to continue to develop background knowledge, vocabulary and self-monitoring skills. If teaching reading is an area you are struggling with, never fear. That post is coming. In the meantime, meet with your students who struggle with reading and read with them every day (even if it’s just to check in and ask what they read about). This part of the post is far too important for a single paragraph, so we’ll be going much farther into detail with how to help your struggling readers in an upcoming post. All the other excuses: You’ve heard them all: “I’ve read all the books.” “That doesn’t interest me.” “Can I go to the bathroom?” “Can I draw instead?” “I’ve already read that book.” “I don’t have time.” ok, the last one might be me-because confession time- I am a reluctant reader. I don’t like sitting in the sun reading a book-it’s just not me. I’d rather listen to a podcast, write a blog post or clean my toilet. But, if I find the right book and I’m in the right frame of mind, reading can be fun. I do enjoy books, but maybe one a month (unlike the other ninja that reads one a day). So, motivate reluctant readers by creating a space that invites quiet reading so they learn to enjoy it. That could be soft seating, gentle music or just about anything that takes away the feeling of having to read. Have students recommend their favourite books to their classmates. Create a display like book stores with “Heather’s Pick.” We have free printable sticky notes templates in our Resource Library. 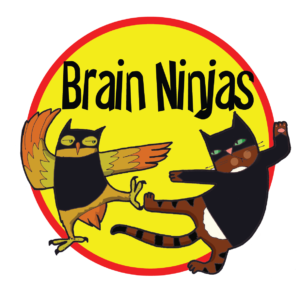 Create some themed reading activities like Flashlight Reading (turn off the lights and read by flashlight), Pillow Reading (bring a pillow and read on it), or find Beach Sounds on YouTube (you can also find rainforest and concentration music). Start doing daily or weekly book talks where you, students or your librarian talk about some of their favourite books. You can even find videos of book talks by authors online. Create a best book challenge. Have your students debate the best books by making a reading list and challenging students to vote on the ones they like the best. Use Reading lists like YRCA (Young Readers’ Choice Awards) or Rocky Mountain Book Awards to curate a list of the best books and have students vote on their favourites. You can easily find the current year of book titles by searching online. Read to your students. Read parts of books or whole books they might not typically choose to read on their own. Reading aloud right after unstructured breaks like recess or lunch help calm your students while providing reading opportunities. Older students loved to be read to, so don’t stop reading to them. Save the assignments for reading for instructional time. Stop making students do work on the books they read. Just let them read for the sake of reading. Fill your classroom with books of all types. Don’t worry about spending a fortune. Use your local public library and learn about how you can expand your classroom library with some tips from this blog post. Provide high interest, low leveled books for your struggling readers. You can find these through companies like Scholastic. Break up reading opportunities. If your science lesson is text-heavy, break up the day or provide alternatives to reading in every single subject. As you build stamina with your reluctant readers you’ll be able to to add a bit of text each week. Provide time to read for pleasure. It only takes a few minutes a day to build a habit. As teachers we forget that sometimes it’s ok to slow down the instruction to enjoy the learning for a moment. Model reading for your students. If you expect your students to sit and read for 10-15 minutes then you should also be using that time to read a good book. Offer opportunities to read books in alternative ways. Find audiobooks, eBooks and videos of authors reading. Your local library can be very helpful with this. Provide reading opportunities masked by other subjects. For example, use drama to help students build their confidence and fluency. Use Readers’ Theatre plays or drama circles to read small amounts of text. Find authentic reading opportunities like reading the school announcements, reading to younger students, class presentations, teaching others, computer coding or presenting at assemblies. Students are not a one size fits all, so your strategies can’t be either. 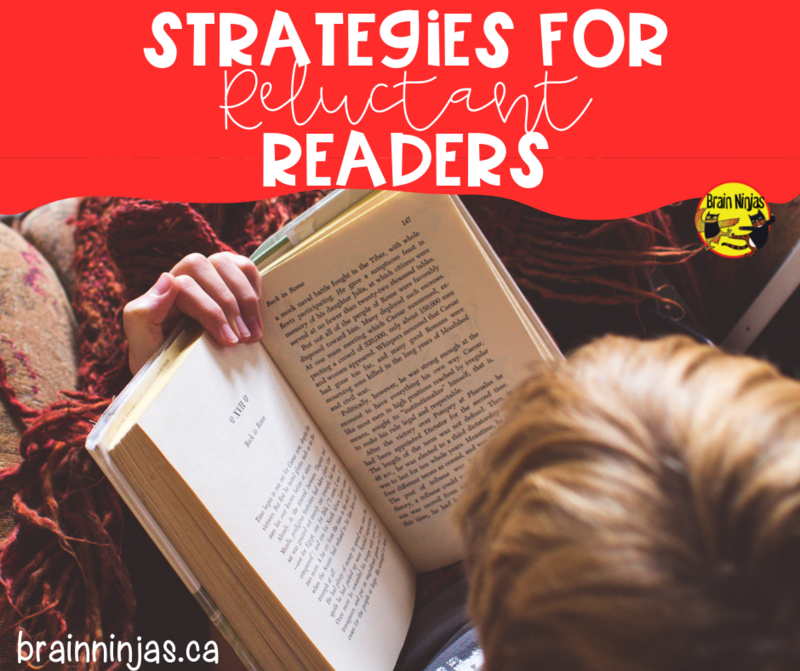 Remember that students who become reluctant readers have different reasons. Once you find out the why, you’ll be able to implement these strategies to engage your readers. None of your students are a ‘one size fits all add a strategy bing bang boom fixed win’, so be prepared to repeat, trial and keep testing these out until your find what works for each of your students. Eventually you’ll crack the code! Did we miss anything in our list? Please let us know by adding it to the comments below.